Mint cards appear "fresh out of the pack," with edges and surfaces free of damage casued by handling and play. Near mint cards show minimal or no wear. They generally have unmarked surfaces and undamaged corners and edges. They may have one or less small flaws such as a small border or corner nick, or possibly a minor light scratch. For a card to pass as near mint any defect should not be immediately apparent and would require close examination in order to be visible. 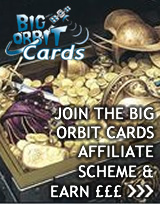 All cards sold on our website are assumed to be Near Mint or better. 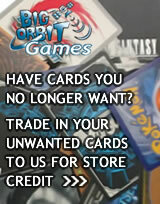 Lightly played cards can have slight border or corner wear, or possibly minor scratches. No major defects are present, and there are less than four flaws on the card in total. Moderately played cards have moderate wear, or flaws that are immediately apparent. Cards of this condirion can show moderate border wear, mild corner wear, water damage, scratches , creases or fading, light dirt buildup, or any combination of these defects.